Synopsis: Faith Sunderly leads a double life. To most people, she is reliable, dull, trustworthy – a proper young lady who knows her place as inferior to men. But inside, Faith is full of questions and curiosity, and she cannot resist mysteries: an unattended envelope, an unlocked door. She knows secrets no one suspects her of knowing. She knows that her family moved to the close-knit island of Vane because her famous scientist father was fleeing a reputation-destroying scandal. And she knows, when her father is discovered dead shortly thereafter, that he was murdered.In pursuit of justice and revenge, Faith hunts through her father’s possessions and discovers a strange tree. The tree bears fruit only when she whispers a lie to it. The fruit of the tree, when eaten, delivers a hidden truth. The tree might hold the key to her father’s murder – or it may lure the murderer directly to Faith herself. I have heard so many good things about this book and Hardinge as an author. Like I said, I don’t know if it was just because being on a boat for 6 weeks had completely mentally drained me, but I found the first half of the book painfully slow. It wasn’t until half way through (coincidentally, when I was settled back at home) that I became more engaged with the story and the characters. 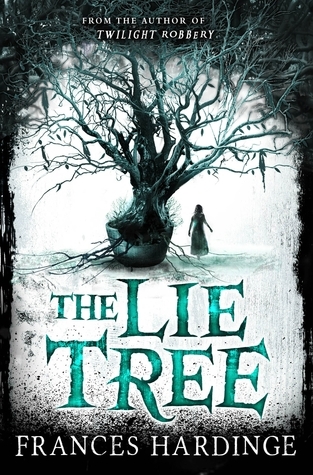 I found the concept really intriguing, and actually loved the descriptions of Faith’s visions when under the influence of the Tree’s “truth fruit”; it was whimsical and magical whilst remaining dark and haunting. I also loved Faith’s bravery and determination to overthrow the societal views towards females – The increase of strong female characters in children’s literature over the past few years has been inspiring and long overdue! Unfortunately, I really hated all of the other characters. I found Faith’s mother intolerable, and Faith’s father was so distant and uninvolved that for the first two thirds of the book, I really didn’t understand Faith’s devotion towards him and his memory. I don’t feel like my review of this book can ever be 100% true to my feelings, just because I really don’t know where I sit with it, and whether my enjoyment of the book was in fact influenced by my severe need to be back on dry land! But overall, I still don’t like I would have fully enjoyed the book as I feel like the characters would have grated on me regardless of my location. Ultimately, although it took me a while to get into it, I genuinely enjoyed it. A dark, mysterious tale with a strong female protagonist. Yeah…but life is too short on maybes – I trust your judgement!